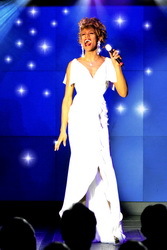 Celebrity Impersonator in Berlin - Ikenna - sings Whitney Houston LIVE! IKENNA - SINGS WHITNEY HOUSTON LIVE! Born in Berlin, Nigerian-German mixture (caf� au lait), spent the first years at school in Nigeria, and had some little dance shows in Nigerian TV, toured with some Bands in Ghana, came back in the early teenager years, with mother and brother, and fell in love with American Pop music, like Whitney Houston and other black singers. Whitney Houston fascinated Ikenna from the first moment like no other. I was speechless, when she began to sing. I just could not believe it. �Wasn�t she that beautiful model?� I thought to myself. She became an Idol. An Idol without impersonators and doubles. Nobody was crazy enough to take the chance. She was untouchable. There was a goal to reach for me. Although I practised her move and behaviour, it felt very easy and naturally to me. The following years I was basically working on the preparations during my time in school, nobody knew anything about it! I had my debut in 1989. With dresses from my best friend, make-up and shoes from my mother. I did my make-up and my hair. I had some gigs and was very surprised how the people reacted. Some people really though I was Whitney Houston! After some time most of them realised that I was a double, but were sure that I was a woman. Some tears fell � It was very touchy. I took a time out for about 7 months to optimise some details, and so I worked on my voice to make the show even better. The next goal to reach. Some voice coaches told me that it was impossible to reach Whitney�s voice range, not to mention her power or intensity, because of my very deep voice. Is that it? I thought to myself. And I was not afraid to �try it on my own�. And I felt it, I had it in me. Five octaves, witch I was capable to use in a good way, after only three years of practise. I sing �LIVE� without exception. Now I have good designers who exactly know what I want. I sew my own wigs, and wear high heels that are 11cm and more. My repertoire includes every song Whitney Houston has ever done! But of course a lot more beautiful songs. I also work with other artists for duets, and I give concerts. I write songs, and compose music. And I sometimes work as a background singer for music studios. For example I was the background singer for the group Fancy (German countdown Grand Prix Eurovision 2000), with the song �We Can Move A Mountain� (Over 8 Million viewers). I�ve been involved in several music projects, but the music wasn�t my thing, or the producers wanted to change my image completely, to put me in a kind of boy-group. Nothing against boy-groups but that is not my thing. The Live broadcast of the �Gay Pride Maspalomas de Gran Canaria 2005�, was seen by over 30 million People in 84 countries world wide! The next goal to reach is right before me. Although the music industry does not really know in which market they want to put me (witch is a pity). I will not give up struggling. I want to sing my music, with my voice in my outfits. And I hope that this dream to will come true!